I'm just a home cook living in the West Village/NYC talking to cookbook authors at my dining room table. Every cookbook has a story. 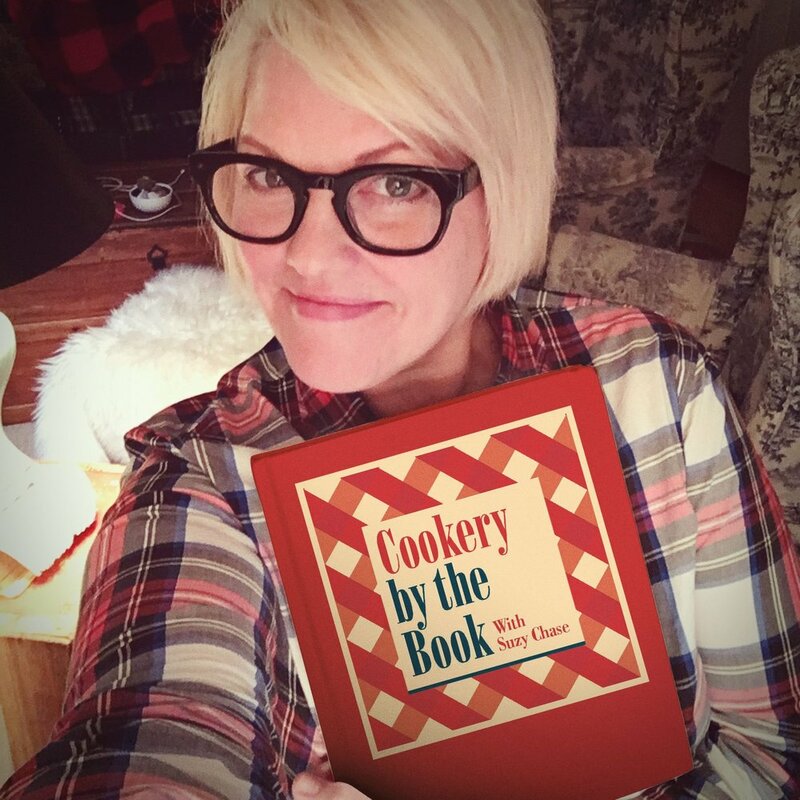 Suzy Chase: Welcome to the Cookery by the Book podcast with me, Suzy Chase. Alexandra: Hi, I'm Alexandra Shytsman, and I am the author of Friendsgiving: Celebrate Your Family of Friends. Suzy Chase: Apparently, last year, ABC reported that Friendsgiving is the new it holiday, so I'm thrilled to be speaking to you, the Friendsgiving expert. What's the origin of Friendsgiving? Alexandra: Sure. First of all, I'm also thrilled to speaking with you, Suzy. Well, the origin of Friendsgiving, I think, for everyone, it's probably a little bit different, but I think it's just about bringing your friends together before the craziness of the holiday season fully sets in because people usually travel home a lot for the holidays, and it's kind of hard to get everyone together because most people celebrate the holidays with their family. Also, I think it's popular among younger people and students, college-age people, and things like that because a lot of people may not have the opportunity to go home for Thanksgiving with their family, so they kind of gather with their friends and have a little celebration wherever they are. I love the versatility of this holiday for that reason. Suzy Chase: Do you think being a Ukrainian immigrant, you moved here when you were nine, you look at Thanksgiving customs through a different lens? Alexandra: Yeah, a little bit. I mean, Thanksgiving, for me, is kind of ... It only entered my life maybe about a decade ago. When we moved here from Ukraine when I was nine, and we didn't really have Thanksgiving. We didn't really adopt that tradition. Even to this day, it's not a super big deal as it is for people who were born in America. For me, I kind of learned about Thanksgiving through The Food Network. I was obsessed with The Food Network when I was a kid. I loved watching Rachael, and Giada, and Ina. They were my everything. I started to notice that when November would roll around, there were all these Thanksgiving specials on The Food Network, and I was so intrigued by the food of the holiday. I had never eaten a turkey before. I had no idea what stuffing was. As a concept, stuffing seemed really odd. It's just old bread and with some stock added. I thought that was kind of kooky and weird. Mashed potatoes I, of course, knew, but all these foods were so interesting to me, and I was so intrigued by this idea of this big food-centered holiday. Because we didn't have it at home with my family, I thought ... I have a lot of immigrant friends as well that I met in my neighborhood in Brooklyn and in high school and stuff, so I would invite ... I started inviting people over for this holiday for my other friends who also didn't have big Thanksgiving celebrations at home. I just kind of started doing this when I was around 17. I made the turkey, and the stuffing, and ... from watching all these Food Network specials about it. I was surprised that I could actually pull this off. It was such a great feeling of accomplishment slicing into that first turkey. Of course, my friends were also excited to have this experience with me, my fellow Ukrainian and Russian friends who were not super into this holiday as well. Yeah, that's kind of how I look at it. Thanksgiving, for me, doesn't have a ton of family tradition attached to it, but it is still a very special day. I think it's my favorite holiday, I think it's safe to say. Suzy Chase: You never had turkey growing up, ever? Alexandra: No, no. I mean, in Ukraine, we ... Of course, there were lots of chickens. I look at turkeys as large chickens. Suzy Chase: The other chicken. Alexandra: Yeah, exactly. But no, never tasted turkey before, I mean, apart from the deli turkey, of course, but that's different. Suzy Chase: There are five menu themes in this cookbook: the Classic, the Cuban Fiesta, the Southern Feast, the Nonna Special, and the Modern. Can you describe the Nonna Special? Alexandra: Of course. This is kind of my take on the classic Italian red sauce joints that you find all over New York City and in Brooklyn. The recipes included in this menu, there's a Chicken Parm, so ... It's kind of my take, and I make my own red sauce for that. It's a very simple recipe. Then there is a Spaghetti Pie, which is an idea that has floated around the internet for a couple of years. You can find recipes also in Smitten Kitchen and Food & Wine for this concept of a side dish. I love it. It's basically pasta in the shape of a pie, and it can be handheld. It can be eaten as a finger food if you wanted to, which I love. Yeah, that's kind of the inspiration for the menu. Suzy Chase: I love that you have ... With every menu, you have a timeline like one day ahead, two hours ahead, one hour ahead, and then you have suggested wine pairings. Alexandra: The timeline, specifically, was ... This was a huge thing for me for this book. This is something that I kind of learned to do on my own every time I host a dinner party at home, whether it's Friendsgiving or other occasions. I think it's very important. I'm a big planner, so I definitely like to plan in advance and write out, on a piece of paper, all the recipes I'll be making, and I outline roughly how much time each one of them takes and if there's any inactive times that I ... If the recipe has me stop and then stop and hour later, I try to fill that time with executing another recipe. I think that's something that beginner cooks or people who don't entertain a ton at home ... I think it can be a little bit overwhelming like, "Oh, my God. How am I going to get all of these recipes out at the same time? And they all have to be served at certain temperature and garnished a certain way and everything." It can be a little bit overwhelming, and I thought these timelines would be a great addition to just kind of help people relax into it and like, "It's going to be okay. If you start four hours in advance and follow the specific order of cooking the recipes, you'll be golden." I think, a lot of the time, when you invite your friends over and people will ask, "What can I bring? What can I contribute?" I think wine is a great thing to delegate out to your friends. I'm not a super huge wine expert, but I do love to serve wine with dinner, so that's another thing I wanted to include so that you know what to tell your friends when they ask you, "What can I bring?" Suzy Chase: Out of the Nonna Special, I made your spaghetti pie. My 11-year-old loved it. Alexandra: Perfect. Yeah, I saw on Instagram. It looked awesome. You did a great job. I love that star-shaped baking pan. Suzy Chase: It was in a star. I was worried that it would stick because there's a lot of cheese. That was my only nonstick pan. It was in a star, but I thought looked kind of cute. Alexandra: It was adorable. I loved it. Yeah, very festive. Suzy Chase: This is really a guidebook. You also suggest that we can go rogue and pick and choose different recipes from each section. Preparing a traditional Thanksgiving meal is a nightmare, and this book really eases that pressure. For example, what are some alternatives for hosting a large group if you don't have a proper dining room table? Alexandra: Yeah. I think that for people, especially living in New York City, like yourself, and formerly, like me, we have tiny apartments that sometimes can't even fit a dining table. I would hate for people to be deterred from hosting a Friendsgiving or another kind of gathering because they don't have that piece of furniture. I mean, that just sounds silly. I think you can certainly have a buffet instead of a seated dinner. You can put food out on your coffee table or make a little spread on your kitchen counter and just have people sort of serve themselves, make it very casual and laid back. You can purchase some extra floor pillows if you don't have enough seating area. You can literally just seat people on the floor, on your couch. Get all your random chairs from your house and just gather around the coffee table. Your friends really won't mind eating from their laps. I mean, people love being cooked for so much that it really doesn't matter whether you're serving them at a proper dining table or not. I do suggest in the book that you should have enough surfaces for people to put their plates and drinks down. Ikea or thrift stores are great for that. You can get an extra side table if you need it for around 15 bucks, and you're set. Suzy Chase: A dish from the book I wanted to talk to you about is your Choose Your Own Crostini Bar. Can you walk us through that? Alexandra: Absolutely. The Choose Your Own Adventure Crostini Bar was inspired by my very first Friendsgiving. Something that I wanted to do was have, as a side dish ... or I don't remember if it was a side dish or a little snack before dinner, but I made these crostini with goat cheese and caramelized onions. Actually, when I first got this book deal, when I told my friends, the first question everyone asked me was, "Are you gonna put those little bread things in there?" referring, of course, to that crostini. From that kind of evolved this idea of a Choose Your Own Adventure Crostini Bar. Instead of assembling each piece of crostini yourself, you can just put out a bunch of little toppings that people can mix and match. There's a few reasons I love this kind of crostini bar situation. First of all, I think cooking dinner kind of always takes a little bit longer than what I think it will, so I like to have some snacks prepared in advance so that when my friends get there, they can start drinking and snacking and leave me alone in the kitchen to finish everything kind of stress free. That's one reason I love it. Another one is that it kind of makes people feel like they have participated in the preparation of the meal. It's also a really good icebreaker if you're inviting friends who've never met each other before. People can gather around this crostini bar and make their own little snacks and get to know each other that way, kind of making their own snacks, which is nice. Yeah, I love that idea. In the crostini bar, I suggest making caramelized onions, like I mentioned. That's one of my favorite toppings. Another recipe I have is a sun-dried tomato tapenade. Both of those go great with various cheese, so you can do a little bowl of ricotta drizzled with honey and some fresh thyme. That's always nice. Just some crumbled goat cheese is great. Of course, you can do charcuterie, some sliced fruit and vegetables like pears, radishes, cucumbers, things like that. I mean, you can really get creative and use your own palate to guide where you're going to take this. This is another great place, actually, to ask for contributions from your friends. You can say, "I'm having this Choose Your Own Adventure Crostini Bar, and you guys are welcome to bring some baguettes, and cheeses, and things, and then we're all going to kind of create this thing together," which is fun. Suzy Chase: I made the Choose Your Own Adventure Crostini Bar the other night, and it was enough for dinner. Alexandra: Yeah, absolutely. I mean, that's a great lesson for crazy weeknights. Alexandra: Sometimes you get home from work, you don't feel like cooking a whole meal from scratch. You can just slice up a few baguettes, get your favorite cheeses, some olives, things like that. Pour yourself some wine, of course, and just have a really simple, low-key meal. Suzy Chase: One of your favorite parts of this journey was the photo shoot. Tell us about your three-day marathon in the Catskills to shoot this cookbook. Alexandra: I'd been to other photo shoots before for other cookbooks, and magazine shoots, and stuff, but never had I had a team of my own executing my own recipes and shooting a big project like this. It was really a rewarding experience. For food styling, I recruited my friend and colleague, Rebecca Ffrench, who has a couple of cookbooks of her own, most recently Whole Protein Vegetarian, which is a wonderful cookbook, especially for weeknight cooking. She actually let us use her gorgeous house in the Catskills, which was great because I didn't have to rent a studio for shooting. Then for helping us prep some of the food, I also recruited my friend [Sean Argoyez 00:13:31] who is a chef who's worked in amazing restaurants in Texas and New York City, most recently at Cosme. Now he is working as a corporate chef. He was incredible to have on hand to just execute everything super quickly and efficiently. It was nice for me to be able to focus on the photography, on the lighting, on just the visual concepts and have somebody else handle the cooking. Suzy Chase: Tell us about your blog, The New Baguette. Alexandra: The New Baguette is a blog where I feature what I call healthy recipes for busy people. I try to introduce mostly whole foods, plant-based cuisine to beginner cooks. I'm really passionate about healthy cooking and cooking from scratch at home, whole grains, legumes, fresh produce, things like that. That's kind of what I try to showcase on my blog. I've been blogging for a number of years. I actually just left my full-time job last year to pursue freelancing and blogging full-time. It's been a really interesting adventure. Suzy Chase: Where can we find you on the web? Alexandra: My blog is thenewbaguette.com. On Instagram, I am thenewbaguette, and the same thing on Facebook. Suzy Chase: You have given us inspiration to start a new Friendsgiving tradition. Thank you, Alex, for coming on Cookery by the Book podcast. Alexandra: Thank you so much for having me, Suzy. It's been a pleasure. Suzy Chase: Follow me on Instagram at cookerbythebook. Twitter is iamsuzychase. Download your Kitchen Mix Tapes, music to cook by, on Spotify at Cookery by the Book. As always, subscribe in Apple Podcasts.